Oil prices retreated slightly at the beginning of the week as the excitement from the OPEC meeting faded, though sentiment remained bullish in the markets. 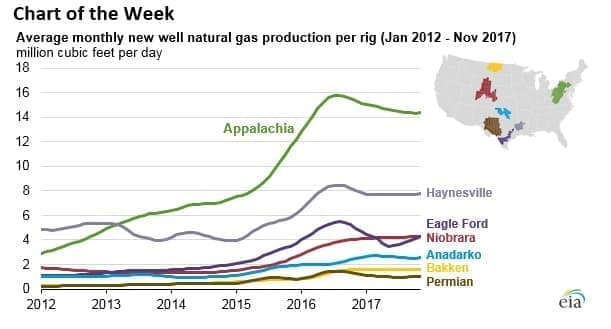 - Natural gas production in the Appalachia region (which includes the Marcellus and Utica shales) has increased by more than 14 billion cubic feet per day (Bcf/d) since 2012. That growth has been the main driver behind the growth in total U.S. gas output. - From January through October 2017, total natural gas output from the Appalachia region averaged 23.8 Bcf/d. 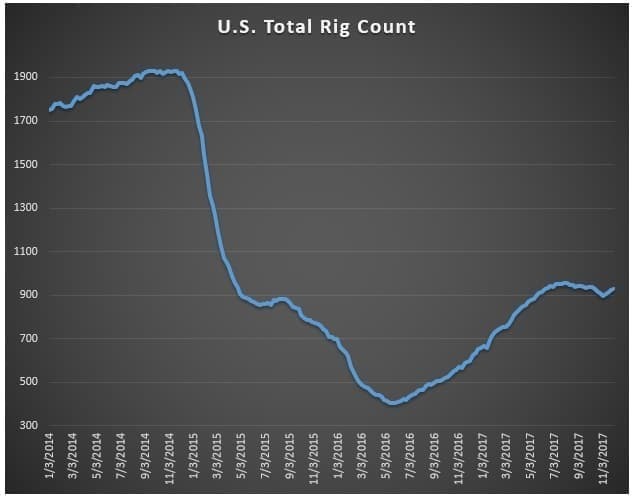 - Gas output per rig from new wells also shot up in the region over the past few years. Since 2012, average monthly output per rig for new wells increased by 10.8 Mcf/d since 2012, much higher than any other region in the country. • ExxonMobil (NYSE: XOM) is considering investments in offshore oil and gas in Egypt, according to Reuters. • CNPC said it discovered a new oil field in the Juggar Basin in northwestern China. • A long list of energy stocks surged on Friday after the OPEC deal was announced. Some of the largest gainers were smaller U.S.-based shale drillers, including SM Energy (NYSE: SM), QEP Resources (NYSE: QEP), and Sanchez Energy (NYSE: SN), among others. Oil prices fell back a bit on Monday as the dust from the OPEC meeting settled. Hedge funds and other money managers still have an enormously bullish positioning, which will leave open the opportunity for profit-taking. “A lack of any significant bullishness in the weekend let the bears regain control they were looking for,” Donald Morton, senior vice president at Herbert J. Sims & Co., told the Wall Street Journal. New Study: flaw in data means EIA overestimated shale growth. Researchers at MIT have discovered a flaw in the EIA’s official forecast, which might mean that the agency is vastly overstating the potential growth of oil and gas production. “The EIA is assuming that productivity of individual wells will continue to rise as a result of improvements in technology,” said Justin B. Montgomery, a researcher at the Massachusetts Institute of Technology and one of the study’s authors, according to Bloomberg. “This compounds year after year, like interest, so the further out in the future the wells are drilled, the more that they are being overestimated.” The EIA has assumed technology has been behind much of the growth of shale, but the MIT researchers said recent growth is more due to the fact that low prices have forced drillers to focus only on the sweet spots. “When that’s all played out, they’re going to have to go to the tier-two acreage, which isn’t going to be as productive,” Dave Yoxtheimer, a hydrogeologist at Penn State, told Bloomberg. The conclusion from the MIT report is that total U.S. oil and natural gas production could undershoot EIA forecasts by 10 percent by 2020, a disparity that widens in subsequent years. OPEC production fell 80,000 bpd in November. 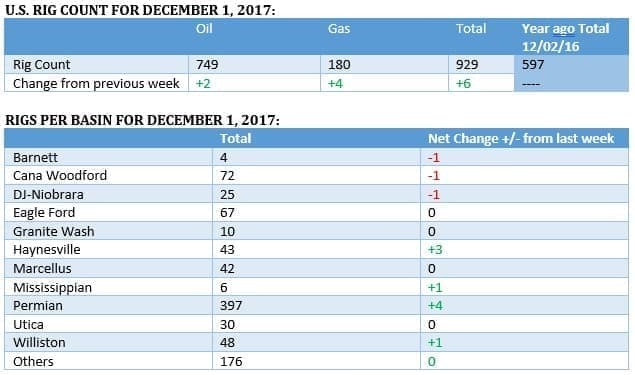 A Bloomberg survey estimates that total OPEC production declined by 80,000 bpd in November compared to a month earlier, dropping to a six-month low. Output stood at 32.47 million barrels per day, the lowest total since May. Much of the decline was the result of a 100,000-bpd decline from Angola, due to field maintenance. Statoil greenlights Arctic project after cutting costs. Statoil (NYSE: STO) decided to move forward with the Johan Castberg drilling project after slashing the estimated costs of the project in half, from 100 billion kroner to just 49 billion kroner (USD$6 billion). The offshore project in the Barents Sea is expected to begin production in 2022, and it is the world’s largest oil project to receive the go-ahead this year. It is estimated to hold 450 million to 650 million barrels. The decision comes after a disappointing year for Statoil, which drilled some wells in the Barents Sea that turned out to be non-commercial. The greenlight for Johan Castberg is a sign that the Norwegian driller is not giving up on the Arctic. Rosneft piles on debt. Rosneft has accrued more than $17 billion worth of debt this year, the largest annual total for the company on record and more than the past two years combined, according to Bloomberg. The fresh debt will help refinance old debt while also investing in new drilling. Because of U.S. sanctions, Rosneft has had to turn to domestic banks and investors. Maduro: Venezuela Could Stop Crude Oil Sales To U.S.